Clinic Synopsis: Bob Mintzer will explore and demonstrate important reasons for studying and playing short etudes in a jazz style and how these etudes can develop jazz concepts for the improviser. He will demonstrate and discuss the essential function of a contemporary jazz etude, how a jazz etude can serve as a solo transcription, and he will discuss how a jazz play-along can provide essential tools to improve improvisation and jazz vocabulary. 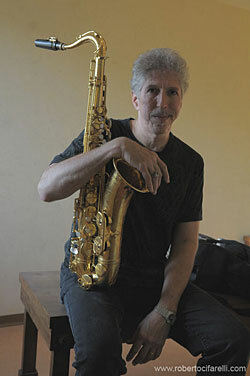 Clinician Biographical Information Saxophonist, Bob Mintzer, is a twenty-year member of the Grammy Award winning jazz group, the Yellowjackets, and also leads his own big band. He appears often as a guest soloist-conductor and travels with his own professional Quartet. A respected educator, Bob is the recipient of the Buzz McCoy endowed chair of jazz studies at the University of Southern California. He has written several jazz text books and over two-hundred Big Band Arrangements performed by groups worldwide. He has also written works for the National Symphony, St. Lukes Orchestra, Metropole Orchestra, and WDR Big band. Mintzer worked with several professional artists including Art Blakey, Jaco Pastorius, Sam Jones, Randy Brecker, Gil Evans, GRP All-Star Big Band, Buddy Rich, Thad Jones-Mel Lewis, Tito Puente, and Eddie Palmieri, to name a few.